Let the Universe inspire you. Thank you for supporting the W. M. Keck Observatory. Keck Observatory is registered as a 501(c)(3) non-profit organization. NOTE: To protect our donors from fraudulent activity that has been linked to PayPal transactions involving small, single-digit amounts, we are only accepting donations of $10 or more. Learn more. Astronomical discovery continues to reveal breakthrough knowledge on Cosmology, often with unanticipated opportunities and challenges. Investment in the Director’s Fund helps address immediate needs for new research tools and systems to take advantage of these opportunities. The Keck Planet Finder Instrument is a high-resolution spectrometer that will lead the world in the discovery, confirmation and characterization of exoplanets. With this Instrument, Keck Observatory astronomers will measure exoplanet masses and densities that will lead them toward determining if these planets are “rocky” and possibly Earth-like. The Keck Science Collaborative provides travel and research support to Keck Observatory resident astronomers focused on joint research and publication with scientists from our partner institutions. 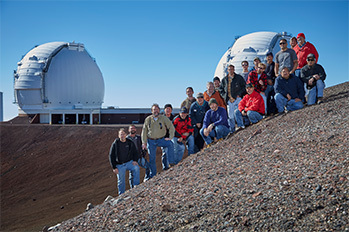 The Keck Visiting Scholars Program provides opportunities for early career scientists to spend time at Keck Observatory, working directly with the staff and the Keck Telescopes, supporting both Keck Observatory resident and visiting astronomers in cosmic research, and conducting their own observations using our state-of-the-art instruments. In a century where science and technology continues to dominate our lives, Keck’s goal is to inspire students to pursue challenging and meaningful work. Investment in Rising Stars helps provide many ways to attract young people to scientific and technical pursuits. Please note: All payments for this site are processed via PayPal secure servers. Your credit card/bank account information is secure, confidential and not provided to us by our payment processor. PayPal requires a mailing address when completing your donation transaction for official recognition by Keck Observatory of your charitable gift. Thank you for your generous support of the W. M. Keck Observatory and for becoming a valued champion of our mission to advance the frontiers of astronomy and share our discoveries to inspire the imagination of all.